For the airport in Louisiana also known as Ryan Field, see Baton Rouge Metropolitan Airport. 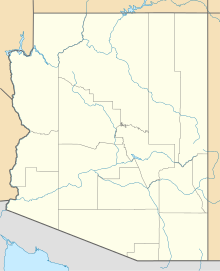 Ryan Airfield (ICAO: KRYN, FAA LID: RYN), also known as Ryan Field, is a city-owned, public-use airport located 12 miles (10 nmi; 19 km) southwest of the central business district of Tucson, a city in Pima County, Arizona, United States. It is included in the National Plan of Integrated Airport Systems for 2011–2015, which categorized it as a reliever airport. It is mostly used for general aviation but also serves a significant amount of law enforcement and military helicopter activity. Approximately 50% of Ryan's traffic is training-related. Although most U.S. airports use the same three-letter location identifier for the FAA and IATA, this airport is assigned RYN by the FAA but has no designation from the IATA (which assigned RYN to Royan - Médis Airport in Royan, France). The airport's ICAO identifier is KRYN. 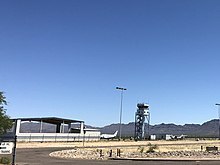 Ryan was built by the United States Army Air Forces in 1942 as a site for primary flight training and was part of many Arizona World War II Army Airfields. Military flight training at Ryan ceased in 1944 and the property was conveyed to the State of Arizona in 1948. Currently owned by the City of Tucson, Ryan is operated by the Tucson Airport Authority under an agreement which expires in 2054. An air traffic control tower was constructed at Ryan in 1993. The airport was added to the Contract Tower Program in 1996. In September 2004, the tower staff completed the one millionth operation without an error. In May 2010, the tower staff achieved two million operations without an error. Significant infrastructure improvements and major maintenance projects are accomplished continuously, as is private and commercial hangar construction. Only runway 6R is serviced by an instrument approach. It allows pilots to land with ceilings as low as 250 feet above ground level. Runways 6L and 6R are the preferential runways, and they are used with tailwinds up to 10 knots. For the 12-month period ending March 31, 2009, the airport had 159,806 aircraft operations, an average of 437 per day: 97% general aviation and 3% military. At that time there were 192 aircraft based at this airport: 91.7% single-engine, 5.7% multi-engine, 2.1% helicopter, and 1.6% helicopter. 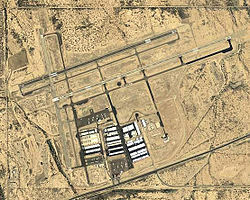 ^ a b "Ryan Airfield". Tucson Airport Authority. Retrieved July 28, 2012. ^ a b c d e f FAA Airport Master Record for RYN (Form 5010 PDF). Federal Aviation Administration. Effective May 31, 2012. ^ "Ryan Field (RYN)". Airport Directory. Arizona Department of Transportation. Retrieved July 28, 2012. ^ "Ryan Field (ICAO: KRYN, FAA: RYN, IATA: none)". Great Circle Mapper. Retrieved July 28, 2012. ^ "Batom Airport, Indonesia (IATA: RYN, ICAO: LFCY)". Aviation Safety Network. Retrieved July 28, 2012. Wikimedia Commons has media related to Ryan Field (airport). This page was last edited on 4 October 2018, at 20:10 (UTC).